Mechanical Typewriter Types Your Tweets! While we weren’t able to visit the Toronto Maker Faire this past weekend, a friend let us know about this great hack. A mechanized typewriter that types out tweets directed at the maker, @mschwanzer! [Michael Schwanzer] has a few blog posts outlining the build, but the first part of this news article and accompanying video explain it quite nicely. The printer-typewriter features an array of solenoids that are controlled by an Arduino using shift registers. A Raspberry Pi collects the information from Twitter and then parses the data to the Arduino for typing. A simple concept, but a complex and relatively expensive build. Calculator watches were the Geek cred of the 80’s. Today everyone is getting smart watches. How can the hip Geek stay ahead? [Gabriel Anzziani] to the rescue with his Oscilloscope Watch! [Gabriel] has made a cottage industry with his micro test tools. We’ve featured his Xprotolab and Xminilab on here on Hack a Day more than once. The Oscilloscope Watch basically takes all the features of the Xprotolab and squeezes them down into a wrist watch. The Oscilloscope Watch includes an oscilloscope, a logic analyzer, an arbitrary waveform generator, and of course it tells time. The Oscilloscope Watch’s processor is the AVR XMega128. [Gabriel] has even included a link to the schematics (PDF) on his Kickstarter page. We really like that 3D printed case, and hope [Gabriel] opens up his CAD designs for us to work with. Like its predecessors, the Oscilloscope watch won’t be replacing your Tektronix scope, or even your Rigol. Much like a Swiss army knife or Leatherman tool, the Oscilloscope Watch packs a bunch of tools into a small package. None of them are as good as a full-sized tool, but in a pinch they will get the job done. If you are wondering where the probes connect. [Gabriel] states on the Kickstarter page that he will design a custom 9 pin .100 connector to BNC adapter to allow the use of standard probes. The screen is the same series of Sharp Memory LCD’s used in the Pebble watch. [Gabriel] chose to go with the FPC version of the Sharp LCD rather than the zebra connector. We’ve learned the hard way that those flex circuits snap at the LCD glass after only a few flexes. Hopefully this won’t impact the hackability of the watch. 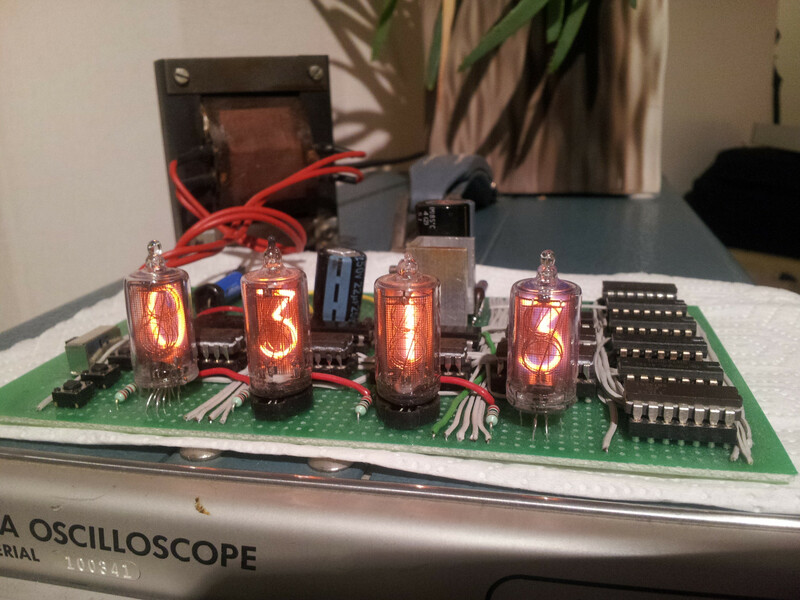 Here is a very nice project that [Znaxque] finished a few months ago: a simple nixie clock made with logic gates only. In this build, the mains 50Hz is used as a time base instead of a 32KHz crystal that most readers here may use. In the very long term, this clock may actually be more precise than a crystal-based one as power companies in Europe adjust the mains frequency. However, at a given moment the difference between this clock and a reference may be as big as 60 seconds. The design was sketched on a simple piece of paper and later made using salvaged ICs. [Znaxque] only bought the six IN-14 nixies for $45 and the veroboard shown in the picture above. The BCD to Decimal decoders are 74141s and three buttons are present on the board to set minutes, hours, as well as resetting all the counters. Creating wearable electronics that are functional and not overly bulky is very, very hard. [Zak], though, makes it look easy. He started his DIY digital wrist watch to see how much he could cram into a watch-sized device. The finished product is really incredible, and one of the most amazing DIY watches we’ve ever seen. The electronics for the watch include an ATMega328p, a DS3231M Real Time Clock, a Microchip battery charger, and a few resistors and caps. The display is an OLED, 1.3″ wide and only 1.5 mm thick, contributing to the crazy 10mm overall thickness of the watch. The software is where this watch really shines. Along with the standard time and date functions, [Zak] included everything and more a wrist watch should have. There is an interface to set up to ten alarms on different days of the week, a Breakout and ‘Car Dodge’ game, a flashlight with integrated ‘rave’ mode, and a stopwatch. On top of this, [Zak] included some great animations very similar to the CRT-like animations found in Android. It’s a fabulous piece of kit, and if any project were deserving of being made into an actual product, this is it. You can check out [Zak]’s demo of all the functions of his watch below. While it may not look like much, the image above is a piece of the original email where [Ken Thompson] described what would become the implementation of UTF-8. At the dawn of the computer age in America, when we were still using teletype machines, encoding the English language was all we worried about. Programmers standardized on the ASCII character set, but there was no room for all of the characters used in other languages. To enable real-time worldwide communication, we needed something better. There were many proposals, but the one submitted by [Ken Thompson] and [Rob ‘Commander’ Pike] was the one accepted, quite possibly because of what a beautiful hack it is. [Tom Scott] did an excellent job of describing the UTF-8. Why he chose to explain it in the middle of a busy cafe is beyond us, but his enthusiasm was definitely up to the task. In the video (which is embedded after the break) he quickly shows the simplicity and genius of ASCII. He then explains the challenge of supporting so many character sets, and why UTF-8 made so much sense. We considered making this a Retrotechtacular, but the consensus is that understanding how UTF-8 came about is useful for modern hackers and coders. If you’re interested in learning more, there are tons of links in this Reddit post, including a link to the original email. After banging his head against a wall trying to get a PS/2 interface to work, [Joonas] decided he needed a dedicated logic analyzer. He didn’t need anything fancy; writing bits to a serial port would do. He came up with a very, very simple ATtiny2313-based logic analyzer that can capture at 50+ kHz, more than enough for a PS/2 port. The hardware for [Joonas’] build is a simple ATtiny2313 breadboard adapter, an FTDI Friend, and not much else. The 2313 has eight input ports on one side of the chip, making attaching the right logic line to the right port a cinch. The highs and lows on each logic line are sent to a computer over the FTDI chip, converted into OLS format, and piped into Open Sniffer to make some fancy graphs. [Joonas] was able to capture PS/2 signals with his logic sniffer, so we’ll call this project a success. However, there were a few problems that made this project a little more trouble than it was worth: there is no easy way to turn a serial dump into a binary file, Putty didn’t allow suppressing output to the terminal, and Mac serial ports twinkling above 115.2 kbps don’t work natively. Still, the project did its job, and we couldn’t ask for anything more.